An update to Skype has added new features and designs, some of which are already in place on other messaging apps. For example, Skype Highlights allows you to follow a week's worth of photos posted by friends and family. Sound familiar, anyone? You can also use emoticons and stickers to convey your emotions, or to call attention to a particular photo or message. In addition, you can change the background colors of your messages. The chat screen has been divided into three tabs called Find, Chat and Capture. With Find, you can share content from another app without having to leave Skype. For example, you can share a video on YouTube without having to go to the YouTube app. Chat let's you pass along your reaction to certain Skype messages. And with Capture, you can take pictures and video and add the aforementioned emoji and stickers. 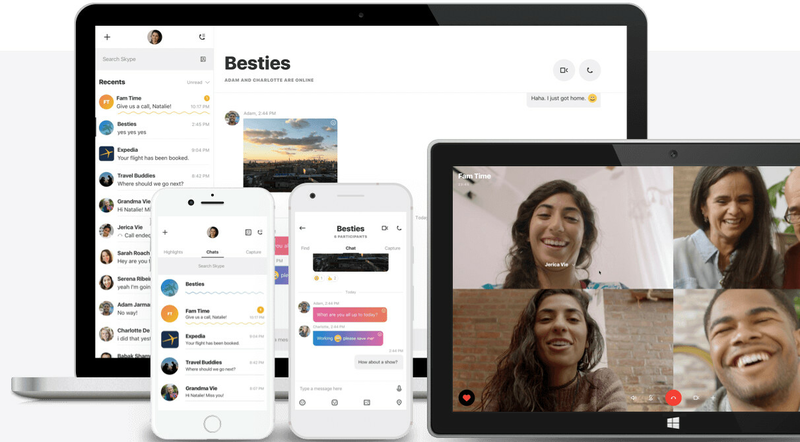 An improved group chat feature is part of the update as Skype tries to freshen up to compete with other messaging apps like Snapchat and Facebook Messenger. Android users will start to see the update rolling out today. Those using iOS will receive the update shortly, as will those with a Windows or Mac machine on their desktop. lol at all the comments mentioning that kiddie discords where their usernames are name#6483 random numbers lol skype is better but this update is not that good.